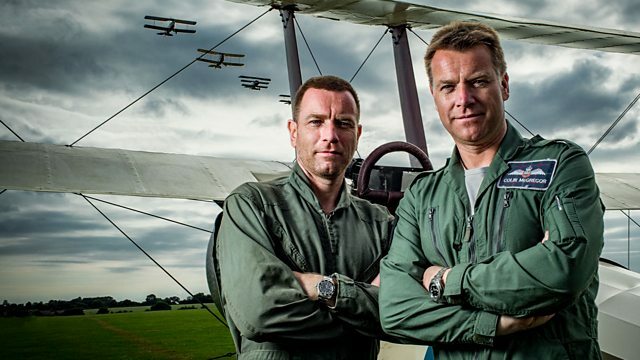 To celebrate the centenary of the Royal Air Force, Ewan and Colin McGregor meet people from throughout its history and take to the skies in some of the world's most iconic planes. To celebrate the centenary of the Royal Air Force, Ewan and Colin McGregor take to the skies in some of the world's most iconic planes. These are the planes that were involved in aerial combat at every stage of the RAF's story, from the biplanes used in the early days of dogfighting in World War I to the beautiful Spitfire of the Battle of Britain, the plucky Lysander and on to mighty Vulcan nuclear bomber, as well as the Chinook helicopter and supersonic Typhoon that are still in service today. It is a story of amazing machines and epic battles, but above all it is the story of the men and women whose courage and ingenuity have been at the heart of the RAF for 100 years. On their journey Ewan and Colin meet an amazing cast of characters. There is Geoffrey Wellum, who fought in the Battle of Britain as an 18-year-old and speaks with passion about what it meant to take on the might of the German air force. Mary Ellis and Joy Lofthouse were two of the pioneering flyers of the Air Transport Auxiliary who delivered thousands of planes to frontline units in World War II. These two ladies share their memories of their glamorous but dangerous role. Then there is Fred Bailey, who was plucked from a clearing in the jungles of Burma by an intrepid RAF pilot just as the Japanese closed in on him, and also the band of brothers, the Bomber Boys, who brought devastation to German cities in their Lancaster Bombers night after terrifying night. Their direct descendants were the Cold War aircrew like Jonny Tye and Martin Withers, who had the grim task of dropping the atom bomb and accepted their role knowing that, if they ever had to carry out their orders, it would be a one-way mission. While technology has changed with amazing speed, the need for bravery and coolness under fire has not. No-one displays these qualities better than David Morgan, who is the last RAF pilot to take part in a dogfight. He talks with chilling clarity about the day he shot down two enemy aircraft over the Falkland Islands but also with humanity about how he has had to live with the personal and emotional consequences ever since. Finally there are today's ground crew and pilots, who take Ewan and Colin on a supersonic flight in the Typhoon fighter as they make their own all-too-real preparation for deployment to the skies over Syria and Iraq.